Yeah! And when you get there tell your mother I say "Hello!" No. Don't stand up, sit down. I am serious. Sit down. If that line enthralled you, plucked all of your heart strings, and this is the first time you have felt it. My dear friend, you are clearly disingenuous and simply flow with the ignorant tide. Now, sit back down, I implore you to be seated, be calm, let me speak to you. You need to understand a few things. If understanding is something you are morally against, then please leave this page and return to your fantasy football league, or sodoku, or whatever inane act you participate in that is no more fulfilling than my using the washroom every morning. Actually, I would contest that my using the washroom every morning has more profoundness and clarity of mind to it than those former actions. Are you seated? Great, now we can begin. You need to educate yourself, for those of you that already know, great, allow me to reiterate. This is not a new phenomena, that we, Muslims, sons and daughters of this once great Ummah, are being humiliated. Ironically, however, there are those who call themselves Muslims, who live amongst us, that have done more to destroy Islam, to humiliate Muslims than any non-Muslim could ever hope to achieve. And they hope to achieve a lot, and they will not stop, and they will keep coming back, pushing the envelope further and further, until one day, one idiot Muslim does something so extreme that America (my country) has supposedly no other choice other than to invade Iran and initiate WW III. The Prophet (S)'s house in Medina, where he lived after the migration from Mecca was destroyed by the Saudi government. Ironically, the signs of King Abdul Aziz bin Saud's existence are considered as national heritage and are being saved. While, other historical mosques, sites related to holy Prophet (S), his progeny, wives and companions, and religious sites, hundreds of which have been demolished by the Saudi rulers, may still be on the list for demolition. The house of the Mawlid where Prophet Muhammad (S) is believed to have been born in 570 was destroyed by the Saudi government. Originally turned into a cattle market, it now lies under a rundown building, overshadowed by a giant royal palace and hotel towers. The then-king, Abdul Aziz, ordered a library built on top of the site 70 years ago as a compromise after Wahhabi clerics called for it to be torn down. May 1, 1925 - general destruction of these holy sites began as early as 1806. Mausoleums in al-Baqi' were demolished by King Ibn Saud of Saudi Arabia. In the same year, he also demolished the tombs of holy personalities at Jannatul Mualla in Mecca where Prophet Muhammad (S)'s wife, grandfather, and other ancestors are buried. This happened despite protest by the international Islamic community. The house of Khadija (R), Prophet Muhammad (S)'s first wife, was laid waste. Muslims believe he received some of the first revelations there. It was also where his children Fatimah and Qasim were born. After it was rediscovered during the Haram extensions in 1989, it was covered over and it was made into, well, do you really want to know? Do you want to know what they built on top of Khadija (R)'s home, the first woman and first person to enter Islam and the Prophet (S)'s most beloved wife? Toilets! The Dar ul Arqam - The first school where our Prophet (S) taught. This is before it was destroyed in 2002 by the fanatical Wahabis. Dar al Arqam, the first Islamic school where Prophet Muhammad (S) taught. It now lies under the extension of the Masjid Al Nabawi of Madinah. It was named for the seventh or eleventh sahabah (companion) to enter Islam, Al Arqam ibn abil Arqam. The House of Al-Arqam ibn-abil-Arqam, known afterwards as the House of Islam, was the secret place where the Faithful used to meet with him, away from the disbelievers of Qur'aysh. In the sixth year of the Mission, two powerful citizens of Makkah, belonging to the big tribe of Qur'aysh, announced their adoption of Islam and joined the Faithful in their holy procession towards their objective of gathering all the people round to worship Allah. Those were Hamzah ibn-’Abdul Muttalib, the Prophet (S)’s uncle, and `Omar ibn Khattab (R). 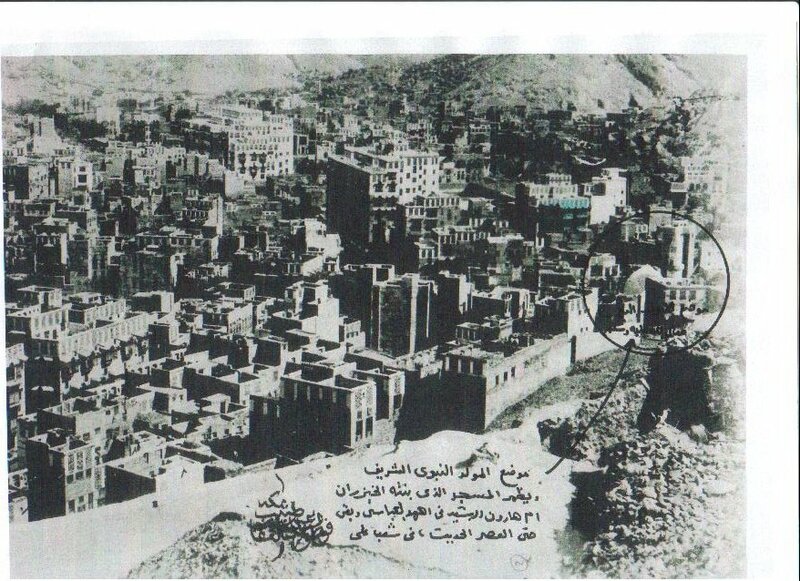 The house of Abu Bakr As Siddiq (R) was leveled to make room for a Hilton hotel. He was the blessed best friend of our Prophet (S), the first man to accept Islam, and the one who stayed with our Prophet in the cave when the Meccans were hunting them down. Abu Bakr (R)'s mosque was destroyed also to allow for the installation of ATM machines. I guess Abu Bakr (R) really was a generous man. You can't find this today, instead you can sleep here in the "grand" Hilton the Saudis constructed for your enjoyment! The new Masjid Al Haram Expansion Project, that is costing well over 1 billion dollars. The whole point is to accommodate an extra 1.2 million hajjis and hajjas (pilgrims) every year. Let me ask you something. Why was there ever a limit on the number of pilgrims? Well, the Saudis began constructing all around the Ka'bah which limits the number of people that can be there at one time. (Historically, the Meccans never dwelt inside the Haram's area. Noting that it was sanctified.) It was not like this until the early 19th century when the Saudis were in full control of the Hijaz and the sacred sites. Before, what did Muslims do? They went about their Hajj or Umrah with no issue because there were no structures preventing them from doing so. So, the solution on the Wahabi side is clear, we need to accommodate more pilgrims, so that means we will need more lodging, and more restaurants, and more, well, everything! Ridiculous! They are turning Mecca into a resort. I highly doubt this is what our noble Prophet (S) had in mind when he commanded us to attend the pilgrimage. 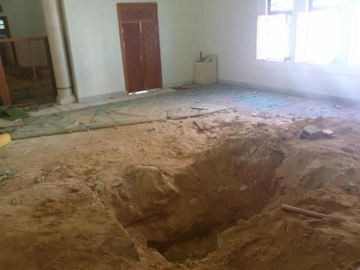 Shaykh Ahmad Zurruq's grave was desecrated in Libya. (If you don't know who he is, and if you are opposed to the veneration of saintly people, then click on the source and read the article, it may not convince you, but at least it will make the argument clear.) He wrote the fantastic book entitled, "The Poor Man's Book of Assistance." 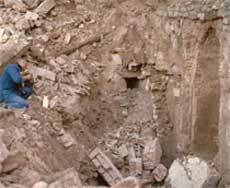 Sami Angawi, the founder and former director of Mecca’s Hajj Research Center and opponent of the destruction of Mecca’s historic sites, estimates that over 300 antiquity sites in Mecca and Medina have already been destroyed. The above is but a very short list. First prevent people from making ziyarah (visitation) to rightfully holy sites. Looks like this is now a foolproof method since they have done this to hundreds of holy sites. Imagine if they could reach to other countries, what would they do there? Oh wait, the Saudis can't reach, but the Wahabis definitely can, that's why you have the destruction and attempted destruction of Muslim holy sites all over the world, including in Libya, Egypt, Pakistan, India, Syria, and any where else the Wahabis start feeling bold. You don't see this nonsense taking place in Turkey, Malaysia, or Indonesia, why? Because they are all traditional Muslims and don't pay any attention to Wahabi doctrines or ideas, they are also very educated, so they know how to handle irrational people. To be Wahabbi is to be irrational. Not to mention utterly ignorant! So, after having read all the above, my point is... Why are you standing up now? When you saw this stupid video called "The Innocence of Muslims." Why are you sitting when the Saudis are destroying our history? Our Prophet (S)'s history? They want to eradicate his presence from the face of the earth! They want to make an argument for the "Historical Muhammad," much like they did with Jesus. Now so-called scholars are questioning the very existence of Jesus, they can't do that with our Prophet, not yet at least, because there is physical evidence of his existence. But even now these so-called scholars are becoming bold and are beginning to assert their claims that the Prophet never existed, it was all some grand fabrication to bring the Arabs together. What nonsense! I am not inciting violence, I abhor it much like our Prophet (S) did. What I am saying is, be patient. There is no need to protest, there is no need to scream and yell, there is no need to kill anyone. What you need to do is be patient. How many times was the Prophet (S) physically harmed by a people, and when given the opportunity for justice he denied it to himself and what happened? Those same people that harmed him became his followers? How did this happen? He was patient with them. Just stop it, all of you, if you think it's a good idea to yell and show your ignorance, then you really need to study your religion and your Prophet more. Islam spreads wisdom not ignorance. We need to take care of our internal issues. We need to really educate ourselves and then educate our families, then educate our friends. But you MUST start with yourself. You need to pick up a few books, discussing the vast array of Islamic ideas and fiqhs. You need to read history. You need to love everyone, Sunnis, Shias, Sufis, even those dumb Wahabis (we should really work on getting them better education). Not just Muslims, but you should also love all non-Muslims. It's all right to have strong opinions, just don't force them on others. Anger as a first response is totally incorrect for a Muslim. Patience is always the correct response.